Johnson Hall was named in honor of Rebekah Baines Johnson, mother of President Lyndon B. Johnson and grand-daughter of Reverend George Washington Baines, president of the college from 1861-1864 when it was located in Independence, Texas. When the building was dedicated on September 26, 1968, President and Mrs. Johnson and several family members were present. The three-story building was renovated in 1991 and houses 70 female residents. Located on the northwest corner of the campus, Johnson Hall sits close to Hardy Hall and the Mayborn Campus Center which houses the gym, workout center, and recreational space. 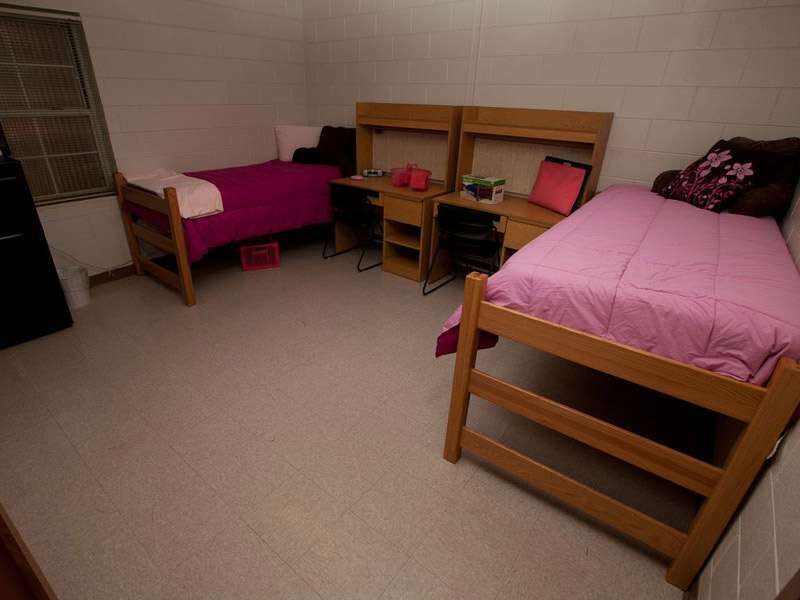 It is within easy walking distance to the intramural fields, academic buildings and the library. This facility includes a large lobby which was renovated for the fall of 2005. The lobby has a TV area and study tables, and there is a computer lab, vending machines, and a central laundry room where laundry can be done free of charge. Approximate room dimensions are 11' x 14' (154 sq. ft.). Shared room comes equipped with two junior loft twin beds with 80" mattresses, two desks, two desk chairs, and two chest of drawers. When the beds are adjusted to their highest level, there is extra storage under the bed. Each resident has a separate closet space and a storage space that is shared. Wireless internet in the building and two internet jacks per room. Cable and internet service are provided. View UMHB Channel Guide. A group of 3 to 5 rooms are arranged in a separate suite sharing a common bathroom. These common bathrooms have multiple stalls, showers, and a large vanity/sink area and are cleaned daily by the housekeeping staff. The window is 4' 3" x 4' (inside casing) and mini-blinds are provided. Floors are tile in a neutral tone and area rugs can be brought in. Walls are a neutral tone and are cement brick. Nails cannot be driven into these walls. Tension rods should be used for window treatments. Students must check with the hall staff for instructions on how to hang items in the room before anything is hung.